Come joy or agony, celebration or struggle, it’s the family that will be by your side and our politicians and their families are no exception to this fundamental nature of human co-existence. While the netas are slogging it out under the scorching summer sun, their family members are doing their bit to help them connect with the voters. For instance, we had never until recently seen the Andhra Pradesh Chief Minister N. Chandrababu Naidu’s wife, Nara Bhuvaneshwari, participating in campaigning and involving herself in party activities. Now, however, she is doing her bit to support her husband. On Wednesday, Bhuvaneshwari conducted a teleconference with TDP activists in the Kuppam Assembly constituency during which she gave a call to the party activists to work hard for her husband’s victory. Nara Brahmani is participating in the public meeting along with son Devansh, in support of her husband Lokesh. Sangita Reddy, the Joint Managing Director of Apollo Hospitals is campaigning for her husband Konda Vishveshwar Reddy. 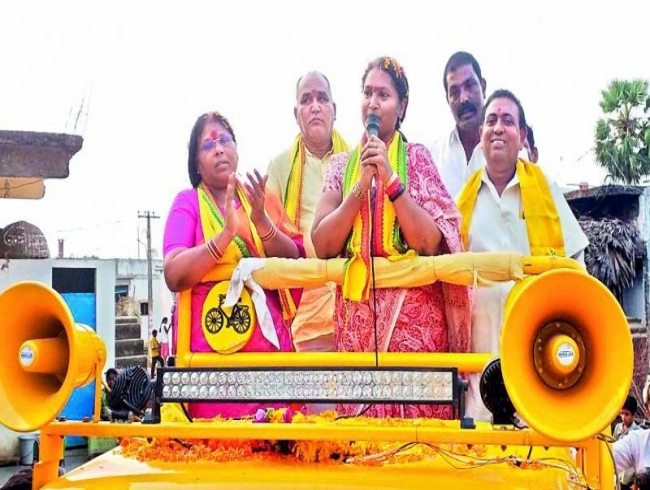 The TDP sitting MLA Nandamuri Balakrishna’s wife, Vasundhara Devi, has been campaigning in the Hindupuram constituency on behalf of her husband. She has, in fact, been trying to win over the voters by participating in many day-to-day activities with the people — like cooking for them, ironing clothes... basically, trying to be one among them. Dr Rama Galla campaigning for her brother Jayadev Galla. According to Sangita Reddy by harnessing a network of trustworthy influencers, including doctors, academics, professors, and the youth, team KVR is managing to reach out to both the urban and rural electorate of the Chevella parliamentary constituency and has also established an offline dialogue with potential voters. As far as the YSRC boss Y.S. Jagan Mohan Reddy is concerned, his mother Y.S. Vijayalakshmi, his sister Sharmila, and his wife Bharati have already hit the roads for him. The TDP MLA Nandamuri Balakrishna’s wife, Vasundhara Devi, has been campaigning in the Hindupuram constituency on behalf of her husband. The candidates’ mothers too are providing full support to their sons who are competing in the upcoming polls. “The public wants to connect with the candidate, and since this is a fairly massive Lok Sabha constituency with its seven MLA constituencies comprising 2,500 villages in all, it is therefore not humanly possible for one candidate to cover all the locations. The next best thing we can do is we, as family, visit the various locations and personally meet and greet the party’s followers,” said the Vizag TDP MP candidate Bharat Mathukumilli’s mother, Srimani. The YSRC leader P. V. Midhun Reddy’s mother, P. Swarnalatha, is very optimistic about her son’s victory. Not only is she campaiging for him, she also filled his nomination paper on his behalf. “It is my duty to help my son win the battle. I am conducting door to door campaigns and also assisting him with the management of campaign affairs,” she said. Y.S. Jagan Mohan Reddy’s mother Y.S. Vijayalakshmi, his sister Sharmila, and his wife Bharati have already hit the roads for him. Galla Rama Devi has joined her family in Guntur in campaigning for her brother Galla Jayadev, who is seeking re-election for the Lok Sabha constituency. Jayadev’s wife Padmavathy and his mother Aruna Kumari have also been campaigning for quite some time now. Rudrama Devi, who heads the Vignan Educational Institutions in Hyderabad, joined her brother Lavu Krishnadevarayulu (YSR Congress Party) in a campaign at Narsaraopet. Alapati Madhavi joined her husband Alapati Rajendra Prasad’s campaign in Tenali while in Chilakaluripet, Prathipati Pulla Rao’s wife Venkata Kumari is actively involved in canvassing. “People want to see politicians together with their family members. The presence of family members during campaigning or in closed-door political meetings amplifies the sense of family unity,” explained a leader.